The Cast Of High Jack Go Crazy In The New BTS Video! Home BOLLYWOOD The Cast Of High Jack Go Crazy In The New BTS Video! 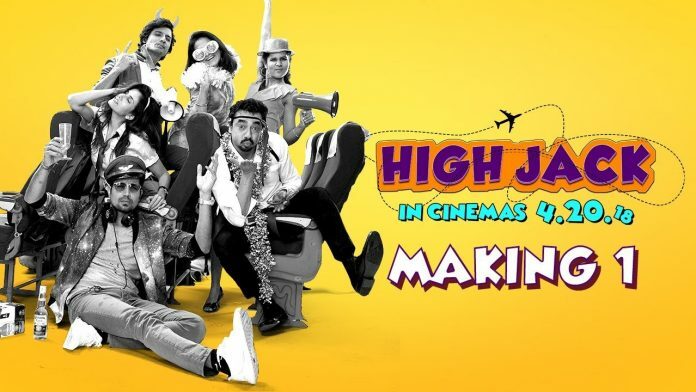 The makers of ‘High Jack’ have unveiled the first behind the scene video from the sets of the film. The video showcases how the cast of the High Jack had a gala time while shooting for the film. In the video, we can also see the captain of the ship Akarsh Khurana showcasing his funny side as we see him dancing in the video. The BTS video showcases the technical aspects about what all went into making the film as the film is set in an airplane. Touted as Bollywood’s first stoner comedy the film also showcases the beautiful locations of Goa and the culture there. The video also will raise the alacrity of the audience, as we can see a glimpse of Abish Mathew in the video, raising the question that will he also feature in the film? The trailer of the film was released recently and it was loved by the audience for its quirkiness and fresh take on comedy. Highjack revolves around a bunch of first-time hijackers, trying to hijack a plane. The first-timers along with the passengers accidentally get high, which results in a series of very funny, whacky series of events. The film involves amusing comic scenes with a fresh and unique concept, all happening in the sky.